Biking enthusiasts can get their adrenaline rush as, Polaris India Pvt. Ltd., a wholly-owned subsidiary of Polaris Industries Inc., the world leader in off-road and All-Terrain Vehicles, is all set to showcase the newly launched Indian Scout for the first time in India at the forthcoming Bike Festival of India. The two-day festival is being held from 4th October 2014 at the Buddh International Circuit in Greater Noida. Polaris will showcase four bikes in the two-day festival including the Indian Scout, Indian Chief Classic, Indian Chief Vintage and Indian Chieftain from the stable of Indian Motorcycle. Pankaj Dubey – Managing Director, Polaris India Pvt. Ltd.
Mr. Sandeep Bansil, Dealer Principal, Indian Motorcycle Gurgaon. Indian Scout was recently launched in the United States by the parent company while the bookings were announced open in August in India. Indian Scout is an innovative and aesthetically stunning American cruiser. It introduces the first-ever liquid-cooled Indian Motorcycle engine – an efficient and reliable 69 cubic inch V-twin engine offering 100 HP of performance for impressive power on demand. This new model carries the legendary Indian Scout name into the future in authentic Indian Motorcycle style. 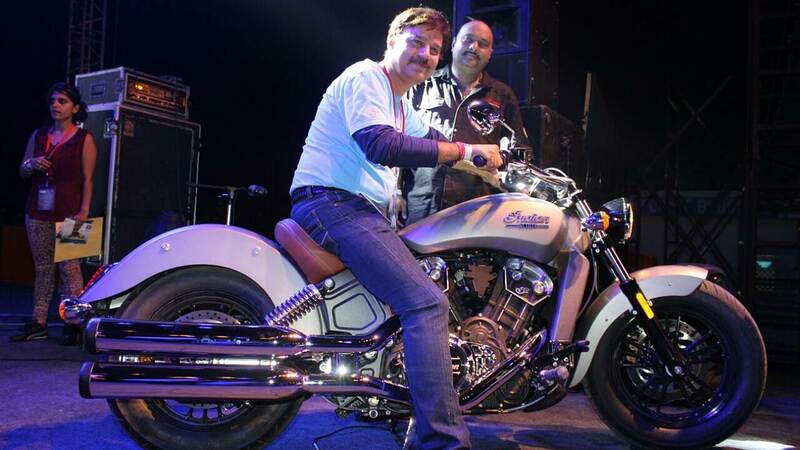 Meanwhile, Indian Motorcycles’ Chief range was launched early this year in India. The Chief range is powered by Thunder Stroke 111 engine that churns out 139 Nm of torque at 2600 rpm. The 49-degree V-Twin engine is the new heart of Indian Motorcycle and marks the first clean-sheet Indian Motorcycle engine design in seven decades. The legendary Indian Motorcycle is available at India’s first and only Indian Motorcycle showroom as of yet, in Gurgaon, Haryana. The showroom, located at B-10, Info City, Sector 34, Gurgaon, Haryana, displays the entire range of the Indian Motorcycle: Indian Chief Classic, Indian Chief Vintage and Indian Chieftain Models.